Immersed in the mountain landscape of Faskruðsfjorður, this Iceland hotel provides beautiful accommodation in the Eastern fjords of Iceland. The Faskruðsfjorður village's atmosphere is peaceful and well suited for families. Marked pathways are in the neighborhood for hiking or biking, while fishing is possible by the harbor or rivers nearby. 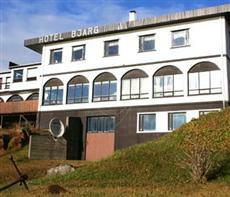 The ideal choice for your accommodation in Iceland, the Bjarg Hotel offers a big wooden deck out of the banqueting room, billiard table, table tennis, X-box 360 games and two bars. The hotel can be entirely rented for marriages, family receptions or business meetings. The ballroom can host up to 140 persons and is equipped with projector, big screen and quality sound system.